As a restaurant, one of our greatest pleasures is when we are able to create memories for people. 2017 is off to a great start with a lasting memory for our team and a family in our community. Through Make-A-Wish Hawaii, an organization that grants the wishes of children with life threatening medical conditions, we were introduced to Tyrell, a 10-year-old diagnosed with Ulcerative Colitis, a chronic, inflammatory bowel disease that causes inflammation in the digestive track. 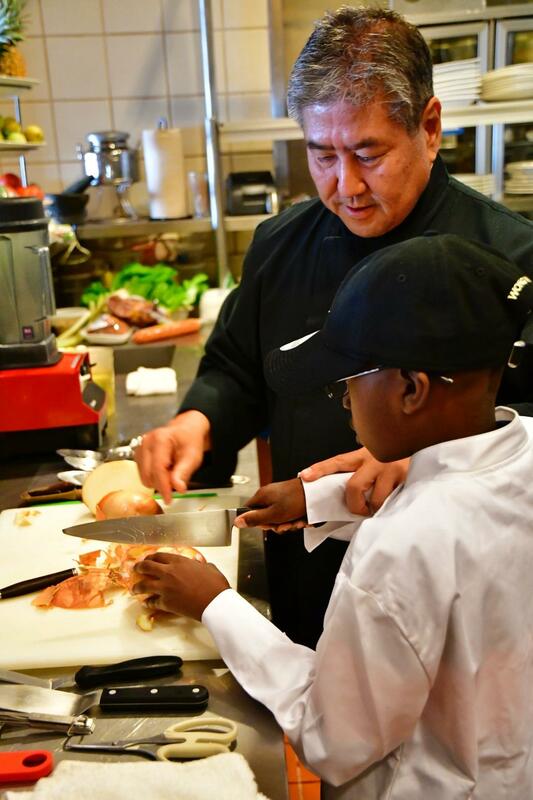 Tyrell’s wish was to be able to cook with a chef that worked with President Barack Obama. Tyrell will have to live with his Ulcerative Colitis for the rest of his life, and learning to eat foods that he enjoys and will benefit his body was important for his parents. Tyrell is a science enthusiast and seafood lover, so we thought he might enjoy learning more about farming and aquaculture in Hawaii. Our friends at Kualoa Ranch arranged for an amazing experience at the Shrimp Ponds and their new agricultural learning center. Ku’uipo (Ku’i) McCarty taught Tyrell to “throw net”, and he was able to catch a few shrimp of his own. Later, Taylor Kellerman walked Tyrell through the rows of vegetables, where Tyrell was able to taste green beans and yellow carrots that he harvested himself. The following day, Tyrell and dad, Tyrone, and little brother, Tyren, joined us at Alan Wong’s Honolulu. At Tyrell’s request, Chef Alan taught him to make a couple of fresh vegetable soups with chicken stock made from scratch. Tyrell cooked the shrimp he caught, and he and his family ate it with a moromiso wheatberry salad. It was also the first time that Tyrell ate Waialua sweet potatoes with Wailea finger lime. We can’t fulfill every wish, or organization’s request, but this was something we uniquely could do for Tyrell because of our experience cooking at the White House for the Congressional Luau in 2008 and serving the President and First Lady the last several years during their holiday vacations in Honolulu. Our team hopes that Tyrell and his family enjoyed their time with us, and we wish Tyrell all the best with his health and his studies. Click here to see Tyrell's experience in this slideshow.